The Ontario Provincial Police (OPP) released the latest number of road deaths related to distracted driving during the first six months of 2016. (PRLEAP.COM) September 22, 2016 - The OPP's figures for road deaths caused by related distracted driving show that Ontario still has a long way to go and the campaign to stop distracted driving must continue. However, Shop Insurance Canada says numbers are slowly falling and authorities need to be encouraged and continue to create dynamic ways to engage the public. Distracted driving continues to be a huge problem in Ontario and is causing deaths in the province. The Ontario Provincial Police (OPP) says that so far through 2016 it has investigated 38 road fatalities that involved a distracted drivers. The provincial police force says the number of distracted driving-related deaths over the last seven years is alarming. "As of mid-August, the OPP has investigated 38 road deaths in which an inattentive driver was involved, compared to 19 deaths involving an impaired driver," the OPP said Monday in a press release. Industry expert Shop Insurance Canada says that while there can be no celebrating, Ontario's campaigns to halt distracted driving could be seeing tentative results. "The first half of 2016 number of distracted driving-related deaths shows that numbers are slowly declining. The loss of 38 lives is hugely regrettable and shows that the fight must continue to be fought. Authorities need to make sure drivers understand the penalties for distracted driving, while insurance companies need to hit offenders with high premiums. Lastly, non-profits and non-governmental groups focusing on this cause deserve high praise for their commitment." The OPP polices the entirety of Ontario's highways, including the 400-series expressways in the major cities. The law enforcement agency also patrols rural areas that lack their own municipal polices services. The OPP points out that the number of distracted driving deaths since 2009 is high, but 2016 could see numbers fall. "Since 2009, our officers have investigated more than 600 road deaths that involved an inattentive driver," stated OPP Deputy Commissioner Brad Blair, the police service's provincial commander of traffic safety and operational support, in the Aug. 29 release. Working to reduce deaths involving a distracted driver depends on showing drivers that the penalties for driving when distracted are severe. The Ontario Highway Traffic Act states that the maximum fine for distracted driving is $1,000. Bill 31 (Making Ontario's Roads Safer Act) came into force in June, 2015 and opened the range for fines. The minimum fine is now $300 (previously it was $60) and the maximum is $1,000 (previously $500). Authorities long complained that the lowest fine was simply too small to deter drivers from using the phones when driving, for example. Further penalties would help to reduce deaths, but the minimum fine now presents a more potent deterrent. 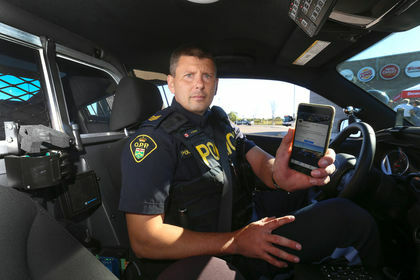 "Simply holding a phone or other device while driving is against the law," the OPP stated. However, to really bring death rates down, other charges need to be implemented. A careless driving charge could be laid, or even a dangerous driving charge. Both of these are part of the Criminal Code of Canada. Making insurance implications harsher could also help, both the above charges can result in auto insurance premiums skyrocketing. "When you are talking on the phone, whether it's hands-free or actually holding the device, your ability to process moving images decreases by about a third, and your field of view narrows by about 50%," Geller said earlier this year. "Hands-free is not risk-free. From a distracted driving point of view, it is not the fact that you are holding the device in your hand that's the problem. It's having the conversation and how that impacts people's brains." What do you want to know about Insurance? Shop Insurance Canada is a Toronto based company that specializes in delivering the best auto insurance products to customers around Ontario and Canada. The online insurance quoting tool uses an engine that is easy to use and accurate enough to deliver the best auto insurance quotes from over 25 of Canada's leading providers. Shop Insurance Canada also offers expert advice on the auto insurance industry, as well as guides and news to help customers find the best deal possible.